The tree was a god with a thousand arms. Crawling on its skin I was less than an ant. I had come to the khaba forest to hunt the Ghost Serpent. For six days I tracked it across the high realm of branch and leaf. I followed it past the ruined wrecks of Opyd nests and skeletal remnants of its former victims. I watched it stalk and devour a wounded jaguar, swallowing the carcass whole. Eventually I followed the great snake to one particular Tree God among the leafy millions. The one that was its home. 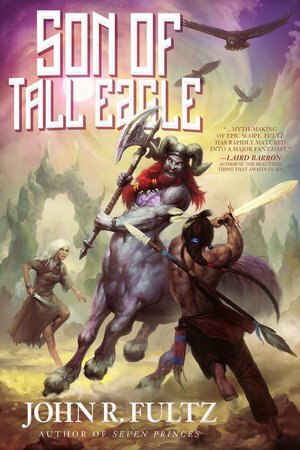 So begins John R. Fultz’s new book, Son of Tall Eagle (2017), sequel to The Testament of Tall Eagle (2015). The tale, a model of .swords & sorcery precision, picks up the story of the People, a tribe of Native Americans, 22 years after they were transported by the alien Myktu to their world in order to avoid their mutual destruction. This new home is a land of crystalline mountains, titanic trees, and other, non-human, races. To a great extent, Tall Eagle’s efforts have been successful. Instead of gaining a reputation for audacity in battle, his son, Kai, is known for his skill as a hunter and one of the rare non-Myktu able to ride their giant birds, the Opyds. The birds allow themselves to be ridden only by those they choose, and Kai is one of those few. He is the embodiment of his father’s aspirations for the People: brave but undesirous of being a warrior; instead, a man of peace with a foot in the Myktu world as well as the People’s. Despite years of peace, despite there being no enemies, even on some distant horizon, all is not as calm as Tall Eagle has hoped for. Several of the People’s young men bristle at the new, quiet ways. Especially incensed is Ganthor, son of Spear Talker, a warrior who died in the battles of the Old World. Red Knife and a band of like-minded young men leave the riverside village of the People in order to live as hunters out in the wilds. This rift sets the stage for a renewal of the Circle of War and greater destruction than any of the People could ever have imagined. One day, without warning, the centauroid Sesthi destroy an outlying village of the People and the Myktu, and send word that they will kill any non-Sesthi who venture into their homelands. In the face of this seemingly unwarranted aggression, it falls on Kai to fly into those lands to convince Urlidain, the Sesthi lord, that peace is in everyone’s interest. When he discovers and attempts to address the origins of the Sesthis’ sudden fury, Kai becomes ensnared in even darker and more dangerous circumstances. In addition to action and adventure, there’s a underlying layer of complexity to Fultz’s novel. 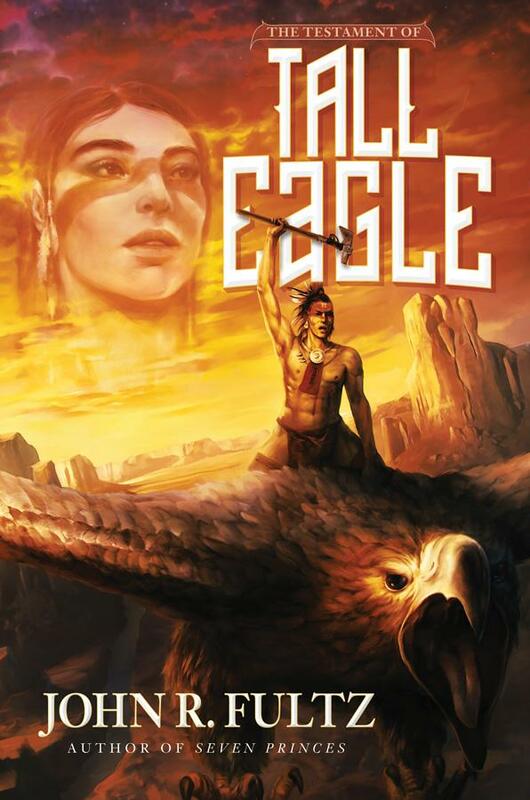 Tall Eagle wants his people to give up their warrior past and become something different. The story asks if this is possible. Kai is faced with committing acts he feels compelled to carry out, but wonders at what cost to his soul and his psyche. It might seem a disconcerting question to raise in a book dedicated to recounting heroic undertakings and bloody action without a hint of subversion, but it works and feels completely proper to the story as Fultz tells it. The peace Tall Eagle yearns for and has instilled in Kai is that of the veteran who knows the price of war; one who has killed often, and has left many friends on the field of battle. To tell the story he wants to, Fultz has cut Kai from a slightly different cloth than most S&S heroes. While not anguished, he is pulled continually between his desires: to break the Circle of War, or to be the defender of the People, the Myktu, and even a righteous avenger? All Kai’s spiritual struggles are presented without mopeyness, but rather with stoicism and willing self-sacrifice. I’ve been working on an essay about what exactly it is I want from swords & sorcery. As much as I’ve written about the subject over the past five years, I don’t think I’ve ever made myself completely clear. I’m getting closer, but I won’t go to deeply into it here. Suffice it to say, at a minimum, a swords & sorcery story must feature a compelling protagonist, an intriguing or exotic setting, and well-paced, well-choreographed action. To differentiate itself from other fantasy, S&S must also have darkness and danger. The world of S&S may not be malign and actively opposed to the protagonist, but it’s at least a deadly, mostly indifferent one. All this must be delivered in prose that’s at once tough, capable of making my heart race along with the hero’s, and redolent of the stories of mighty warriors and cunning rogues sung by the bards and griots our ancestors. That may sound grandiloquent for something so humble as swords & sorcery, but it’s not. We live in a time stripped of myths of heroes like Heracles and Beowulf, but still they call to some deep part of us, stirring our blood with tales of derring-do, clashing steel, the leathery sound of dragons’ wings, and the sulfurous scent of devils. S&S writers are some of our contemporary myth-makers, drawing on their own invention as much as on the great body of human myths legends. John R. Fultz is one of the better, consistently satisfying tellers of new campfire sagas. His early collection, The Revelations of Zang is a wonderfully gonzo Clark Ashton Smithesque series of tales of old gods on the move again, and his Shaper Trilogy is epic fantasy cast in a heroic fantasy mold. His last book, The Testament of Tall Eagle (2015 – and reviewed by me here) is a superb “throwback to the golden days of swords & sorcery of the 1970s.” It’s short, punches hard, and moves relentlessly forward on every page. There is no flab; every word staring up at you from the page counts. In the shadow of those ruins I was snared by the enchantment of ancient things. I wanted to rest here on a mossy terrace, to dream of a life spent among these proud structures when they stood higher than Tree Gods. I lay down for awhile as Swift Wing went to hunt for fresh meat. It must have been the perfume of the great flowers that lulled me to sleep. I should not have slept in that forsaken place at all, but I did. I was weary to my bones. Fultz is a writer with a deep knowledge of the history of swords & sorcery. He knows how it works. He knows how to bring it into the modern age without making it something else. The genre is one predicated on action and protagonists doing bold and heroic things. To discard that isn’t bad, per se, but then it’s a different sort of story. Son of Tall Eagle is more proof that Fultz knows how to tell a story that will grab you and pull you into its invented world and leave you thrilled and exhausted by its end. I freely admit, as I have done many times before: I read swords & sorcery for entertainment. It’s a momentary trip away from the world of mortgages, car payments, and timesheets. Those are the things of real life and I need to do them, but not every minute. Sometimes I like to step into the shoes (or sandals) of someone who is many things I am not; someone who can face a world of danger and survive, if not outright win. For writers like Fultz (and Howard Andrew Jones, and Ted Rypel, and P.C Hodgell, and many, many more) I am extremely grateful. There’s a place for epic tales with casts of hundreds — swords & sorcery is not it. This is a genre of man vs. monster, vs. wizard, vs. the world. Of the hero who, armed with only his courage, or wit, or strength, must fight alone. Son of Tall Eagle is exactly one of those sorts of tales. It is exactly, exactly, what I want from this sort of story. If you have a taste for the work of Burroughs and Howard, this is a book for you. Forty years ago, it would have been found on spinner racks in every drugstore. Now, you can get it from Amazon as an e-book. In the spring it will be available as a trade paperback. Excellent review Fletcher. Fultz is the real deal when it comes to traditional S&S written for today’s readers. I have a copy of this book on my Kindle, and this review only makes me look forward to reading it even more. I very much enjoyed the Shaper trilogy, and this looks to be even more interesting. Can’t beat a Vredenburgh review. John R. Fultz manages to bring a freshness to he genre, inspired by “old” weird fiction but delivering “new” mashups. Great website, reviewer, and author! Glad this made it to publication after Ragnarok publications hiccups. @darkman – Thanx, but then it was a book of the right sort at the right time and got me writing about a few of the things banging around my head right now. JFR is one of the solidest S&S yarn-spinners around these days. @Seth – Thanx for the kind words, but it’s easy to write this sort of review when I really dig a book AND the book is worth digging. I hate it when artists do this ( say’s an artist ) – now I’ll see if the link will show the pic. If it doesn’t you know the cover to Farmer’s ‘A Private Cosmos’ painted by Boris. Excellent review of a great book by a wonderful writer! Actually, the cover to SON OF TALL EAGLE is partly an homage to that Vallejo classic. Let me explain: I’m a big fan of classic painted covers featuring centaurs–always have been. 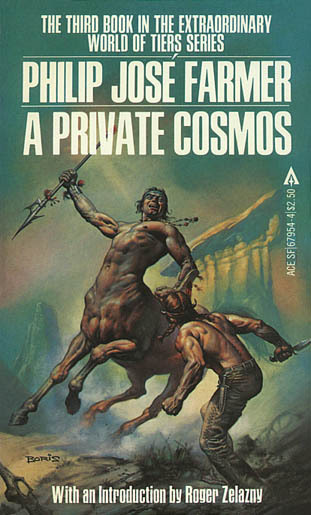 From Lin Carter’s LOST WORLDS with its centaur-riding barbarian queen painted by Enrich Torres–to Frank Frazetta’s Moon Maid cover for ERB’s book of the same name; Vallejo’s cover for Farmer’s A PRIVATE COSMOS was one of the images–along with ones listed above–that I sent to my cover artist Alex Raspad for inspiration. I described the seen of Kai, Son of Tall Eagle, facing down this cenatur (Sesthi) warrior and Athri the Warlord’s Daughter on the other side. SON OF TALL EAGLE the story has nothing in common with A PRIVATE COSMOS–I’ve never even read it–but I’ve always admired that Vallejo cover. So Alex took my description and my inspirational images and did his own thing with them. I think the final result is a pretty damn good cover.